Bollywoo: Calm Before The Storm! The last few weeks have been rather busy with multiple films releasing each week - as many as 13 films were released in the last three weeks alone - all possibly trying to avoid a clash with the biggest Diwali release in the history of Hindi cinema. Ra.One, at a cost of 175 crores, is set to release next week and it's no surprise that this week is going to be quite calm with only one film "Be Careful" releasing this Friday. Come next Wednesday (Oct. 26th), the trade pundits will tell you, the box office will be on fire. Ra.One should take an excellent start at the box office considering that it will be the first Shahrukh Khan release in more than 20 months. Although, his last release (My Name is Khan) didn't really prove to be a winner at the box office - there has been a drastic change in the industry over the last year which may help Ra.One become the highest grossing Shahrukh Khan film. One of these factors is the 5 day weekend. As we witnessed with Bodyguard, a five day weekend can be crucial in the success of a film. Another factor is Shahrukh Khan is the biggest star attraction in the overseas market (9 of 10 highest grossing films in the overseas market belong to him). This is the reason why Shahrukh Khan is holding 3 premieres of the film next week in Dubai (Oct. 24th), London (Oct. 25) and Toronto (Oct. 26) - at a cost of $100 per ticket this should help recover some of the cost. 2011 is the first year where we have already had, a record, 3 films (Ready, Bodyguard and Singham) each crossing 100+ crores in collection. With Zindagi Na Milegi Dobaara generating 86 crores and Mere Brother Ki Dulhan & Yamla Pagla Deewana crossing the 50 crores mark and Murder 2 becoming one of the most profitable films of the year - collecting over 46 crores - you realize what an incredible year it has truly been. You, also, can't help notice that all this has happened before the Diwali and Christmas releases. 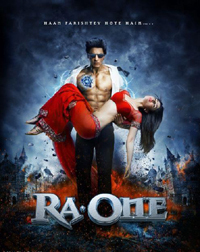 Made at a cost of 175 crores, Ra.One has a gigantic hill to climb, it will need to generate almost 400 crores nett at the box office in order to break even (click here for a detailed analysis). Ra.One is releasing on 3500 screens (in India alone), so, as we witnessed with Bodyguard which released on 2700 screens - the film did 90% of it's business in the first week - similarly, Ra.One will make a majority of it's money in the first week. But a 5 day weekend and no major releases this week may help it get well on its way.